We have noticed an interesting trend blooming, just like the spring flowers we hope to see soon. More and more brushes, it seems, are coming to market without the grip of metal ferrules, which are typically made of aluminum or brass, around their waist. While you might say this is a kabuki-inspired trend, it also seems to lean a bit toothbrush-y, with hairs inserted directly into wood or plastic handle-ferrules. The uber-popular Nars Ita, which features a plastic handle-ferrule. The new Mac Oval brushes, which are possibly the most toothbrush-y things to ever call themselves a makeup brush. Becca’s The One Perfecting Brush, another plastic handle-ferrule. 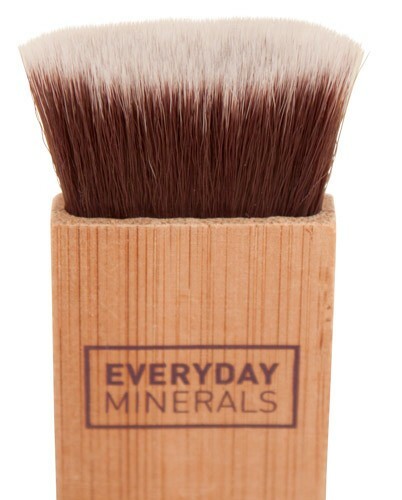 EcoTools Face & Body Sculpting Brush. 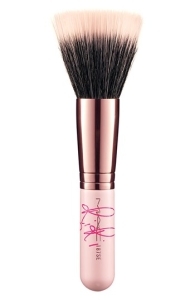 The freebie brush in Benefit’s Box O’ Powder products. In most of these brushes, the hair is super densely packed. That seems to make them excellent for buffing product into your face — a sensation that a lot of women seem to like as they become one with their foundation. This kind of thing also seems fairly exfoliating. But we are really very, very curious about what is driving this trend. Are these brushes really better at improving application in some way? Do they really save time, as several promise? Or are they just unique looking new designs that are therefore easier to market with a good sales hook? Watch a toothbrush being made, from the Discovery/Science channel. We suspect — but don’t really know — that this trend might be being driven by potential cost savings in the factory. Maybe the the lack of a metal ferrule represents a substantial cost savings? 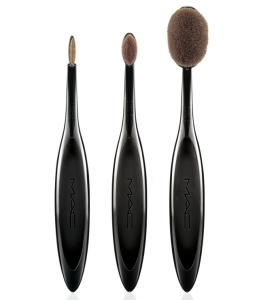 Or maybe these brushes can be manufactured with less labor than a conventional makeup brush? Generally speaking, brush manufacturers have struggled to adopt a substantial level of cost-saving automation because of the sheer variety of brush styles and materials. Enjoy the pretty ferrule of this conventional and sold-out brush: Rihanna for M·A·C ‘RiRi Hearts M·A·C’ 187 Face Powder/Blush Brush (Limited Edition). That’s why most conventional makeup brushes are still made by big armies of women and men, usually in Asia. We suspect this might be the case when you compare the way these ferrule-less brushes are held in the handle to, say, a toothbrush, the manufacture of which is heavily automated, as shown in this toothbrush-making gif. If you happen to know the answer, shoot us an email. We’d love to chat about it. Because we’re dorky like that. In the meantime, gaze upon this pretty rose gold ferrule in the now sold-out Rihanna for M·A·C ‘RiRi Hearts M·A·C’ 187 Face Powder/Blush Brush. In the growing land of ferrule-less brushes, it’s a pretty flower.